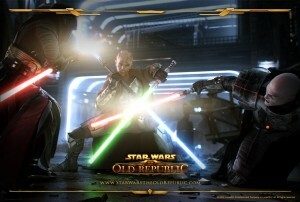 Star Wars The Old Republic is an MMORPG by BioWare and EA Games. It was released last month and within that time frame fans and MMORPG players alike flooded the servers. With that being said this is a game that Star Wars fans must play. The mechanics of this game is similar to any other large scale MMORPG such as WoW but with a twist. The game takes place at a time when the Sith has returned and begins an all-out onslaught on the Republic. 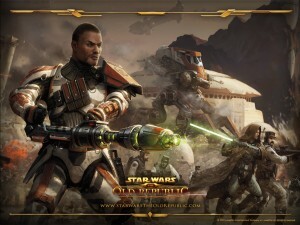 BioWare incorporated their story board interaction feature into SWTOR so now players and party members can share in the interaction with the NPCs that go with the story. Players can make decisions and earn social points as well as Light and Dark points that determine the side of the Force one is deviating to. Parties can enter each player’s story and spectate on the side as well. There are advance quests called Heroics and Flashpoints that require a certain number of players in a range of levels. Since the story is up for discussion, there are several classes on each side that includes countless hours of game play with their own story lines. There is the Trooper class, Jedi, Smuggler, and Agent with their respective sub classes and vice versa on the other side. With each class there are different skill trees to manage that will aid in combat. There are several guides out there that can provide some insight on how to approach managing skills. These stories take the player to different worlds such as Coruscant and Tattooine. How does a player get there? Well with their own ship of course! There are epic space battles/missions. Once a player reaches the level to progress to the next world, they will have the option of partaking in a space battle. Ships are also upgradable with purchasable or crafted components. Speaking of crafting, there are numbers of crafts to choose from. There is scavenging, treasure hunting, cybertech, armstech, armortech, etc. Crew members that join your team during the story can be sent on these crafting assignments at a cost which they return in time either empty handed or bearing fruit. There is a simple guide out there that can provide the perfect combination for what a player wants to do. All it takes is a google search away or even a search on their forums. Depending on which server a player creates their character in determines the kind of game play environments. There are PvP servers and the Non PvP servers. There are PvP sessions as well as a sport game that players can compete in. There is even special gear developed for PvP. No items, currency, or experience is loss upon death in PvP or in story so one can rest easy upon defeat. Equipment does need to repair upon defeat though otherwise it can be risked destruction. Even after beta testing and a month of release play, there are still a lot of bugs that come up during the game play hence it is expected that there will be frequent server down times for maintenance and patches. Overall I give the game a 9 out of 10. If you are a Star Wars fan, then definitely get a copy of this game. It is in stores now and digital copies may vary in price. There is a trial fee upon purchase and subscription fee to continue playing after the trial fee expires. Fees come in packages so players can choose based on their convenience. So what will it be, the Light or the Dark side?